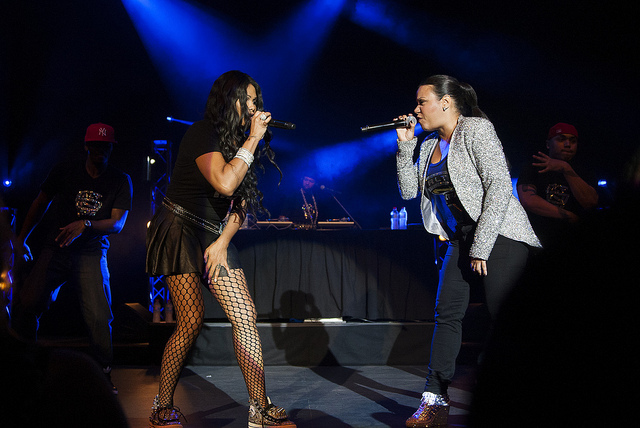 Salt-N-Pepa live in concert. Love the backup dancers. If you're going to be singing Salt-N-Pepa under your breath all day now, I'm sorry/you're welcome. Seriously though, let's talk about squirrels. We have a lot of squirrels here, since our backyard is basically a forest. And squirrels have one mission in life: to get food. Shortly after we moved here we put some bird feeders on top of an 8-foot pole that we could see from our deck. Unfortunately we saw more squirrels up there than birds. Those things are tenacious climbers who really do have nothing better to do all day. We greased the pole with WD-40 and that helped for a few days (it was also amusing to watch a squirrel try to climb a greased pole,) but we didn't want to be out there several times a week squirrel-proofing a pole. Believe me, that's the least of our yard maintenance worries. So we bought a squirrel baffle, one of those ugly cone-shaped things to put on the pole and stop the squirrels from getting up there. But we'd still see them perched up there, literally hanging from their curled toes, eating seeds out of our feeders. I was totally confused as to how they were still climbing the pole. Days later I just happened to see one take a flying leap off of our deck railing with outstretched arms, grab the pole just above the baffle 6 feet away like a freaking Navy SEAL, and shimmy its way up to the top. I should have known then that we were fighting a losing battle. Not long after that, we left our kids with a paid babysitter for the first time ever and went to a play. When we got home, the kids were in bed and the babysitter was thoroughly freaked out because "Um, there's an animal in your fireplace." Needless to say, she didn't come back. I still feel kind of bad that she was stuck in the dark house after the kids went to bed listening to the scrabbling and scratching of the flying squirrel that somehow fell down our chimney. At least we had the glass doors in front of the fireplace closed or she probably would have called 911. Have you ever had a flying squirrel trapped in your fireplace? How do you get it out without letting it loose in your house? Lucky for us, Phillip is an engineer and he devised a long channel made out of cardboard leading to the door. He opened the fireplace, chased the squirrel through the channel with a broom, and slammed the door. If that's not brilliant, I don't know what is. Some things that happened in your house before you moved in, you just don't want to know about. Things were mostly quiet on the squirrel front for years after that. I shouldn't have been surprised one night a few weeks ago to hear a persistent gnawing noise under the floor at my feet as I sat at the computer desk typing. We have yet another flying squirrel, this time in our basement. We're trying unsuccessfully to catch him with one of those Havahart traps, but the thing is too smart and keeps eating the bait right out of the trap without getting caught. So we're basically providing him with a free nightly buffet. I just hope he doesn't recommend our restaurant to his friends. That little squirrel skeleton made me feel so sad! It reminded me of childhood years past when I had pet hamsters that always ran away to hide and die in our furnace. They weren't very bright creatures. OH NO!! This is all kinds of horrible. Poor you guys. Poor squirrel. Poor babysitter. That is a lot of squirrel-induced drama. your husband's trick. my goodness. whatta man, whatta man, whatta man, whatta mighty good man! You know, I really need to start incorporating more Salt-N-Pepa lyrics into my everyday life. Yes, lots of strange drama around here. Hilarious! The squirrels on the flying trapeeze! Hope you catch Houdini soon! And, my mind si so weak, I forgot I had already read this post, Hey, it was last year!! The last post I referenced here. I hope you get some additional traffic from it!